Free Resume Builder and Job Search Manager software to manage job search process using: - Resume Building Wizard - Employment and Personal References - Attachments including certifications and qualifications - ValidateJOB Report - Job Search - Build and Send Job Application Resume Building Wizard The wizard assists job applicants in easily building custom resumes for each job application - within minutes. 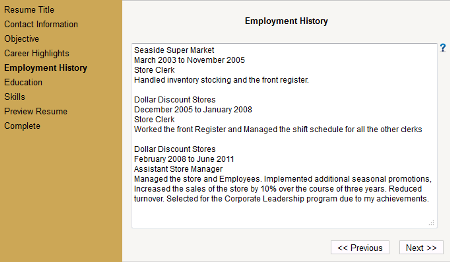 The software is wizard driven with prompts and help for guiding the job applicant in creating a professional resume. In addition the software features a CLONE option that allows the applicant to copy an existing resume and modify as needed. Employment and Personal References Generate and send email request to past employers for Employment References and to friends and family for Personal References. The software features tools to easily manage these references and download in PDF format for printing and mailing hard copies. Attachments including certifications and educational qualifications Upload and manage documents which need to be attached to job applications. These documents could include education qualifications, certifications, art work, portfolio, etc. ValidateJOB Report Job applicants can purchase a ValidateJOB Report - an employment background history report with an easy to use proprietary reporting system, which safeguards the job applicant's private information. It's like a pre-approval for job applicants - It shows the employer, what they can expect Job Search The software features an exhaustive listing of: - Part Time and Temp Agencies - Newspaper Classified listings - Online Job Search Build and Send Job Application The 'Build and Send Job Application' wizard is an easy to use to tool for job applicants to put their application together in a professional format and email to prospective employers. The software allows easy setup and helps job applicants email numerous applications within in a short period. Gnostice Free PDF Reader is a free, fast, and portable application for viewing, printing and converting PDF documents. Free PDF Reader is a Java application. As a result, it can be used in Windows, Linux, and Mac (OS X). Pdf Password remover software not only removes pdf open & owner password but also helps to remove 128 bit RC4 & AES restrictions from pdf file including copy, edit, print, sign, form fill, comment, page extraction, split & merge. Invitation Card application provides perfect solution to create standardized and versatile birthday greeting cards including personal images and text messages for dear ones with advanced background, color and gradient settings in few mouse clicks. Brochure Design Software is integrated with advanced designing facilities to produce high standard cards and labels in significant way. Card and label maker utility facilitates to design variety of cards for visitors, membership and security staffs. Merge .pdf file software extract all pages or selected pages from Adobe documents. Combine two PDFs pages into one or join multiple PDF files into single file without using any third party application. Delete unwanted and useless pages from PDF file. Ailt PowerPoint to WMF Converter provides the fast and easy way to convert PPT, PPTX, PPTM format files to WMF in batches. The output WMF quality is super high with preserving the original text, tables, image, layout of your PowerPoint document. This site does not contain serial number, crack, keygen Resume Builder and Job Search Manager serial number : serial number is the simplest type of crack. A serial number(cdkey,product key,etc) is register the program as you may already know. a crack or keygen may contain harmful software. If you cannot find the exact version you want, just give it a try. for more information read .nfo/.txt/.diz file include in zipped file.